Britten wrote beautifully for strings, especially the bass. He benefitted by having some of the top players in the world at the time working in his orchestra, including Adrian Beers. My favourite four pieces for string ensemble are the Serenade for Tenor, Horn and strings, Nocturnes, Les Illuminations and the Frank Bridge Variations. The bass is for the most part independent of the cello, and therefore important. This excerpt crops up in the UK, less so abroad, although I know Orchestra Victoria have set it in Melbourne. I played it in auditions for Scottish Chamber Orchestra in 2011 and Northern Sinfonia in 2012. 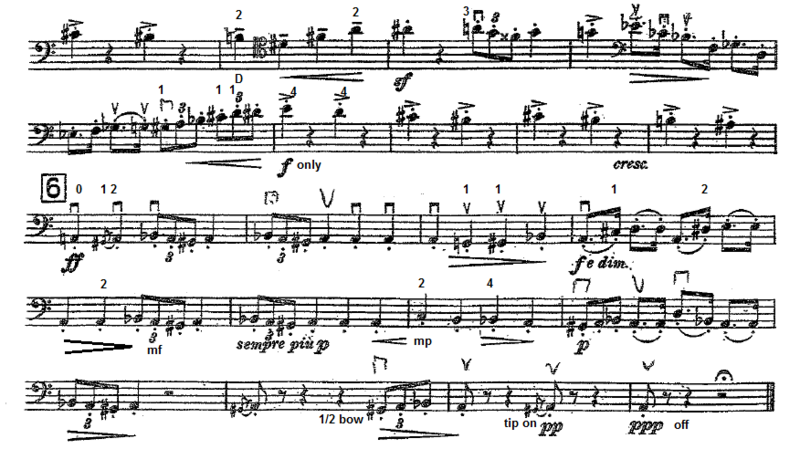 Articulation – Britten put a lot of detail on this page of music. There are very few notes that do not have a dot, accent of sf marking, and those that do not are probably typos, they should have something. There is only 1 sf in the piece, the 4th bar of fig 5, and this needs to be noticed, as this is the sort of detail that audition panels will be looking for. Dynamic range – its massive, starting pp, rising to ff at fig 6 then falling to ppp at the end. As with most cresendi, its easy to get too loud to soon, for example the f at fig 5 and 4 bars before fig 6 should be “only” f, as we need to make the ff at fig 6. The passage from 5 before fig 5 is easy to make a cresc, as we can see the f at 5 in the corner of our eye – this must be resisted, as the cresc is only in the last two beats before 5, ie very quick. 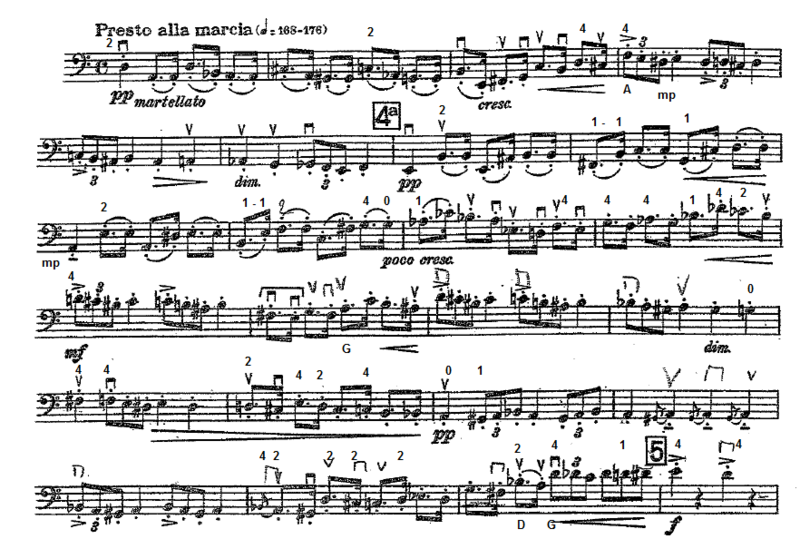 These passages need attention with a metronome.